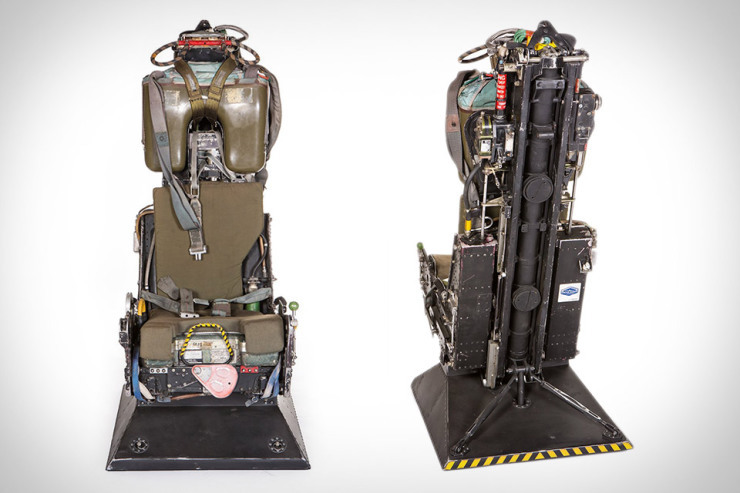 Buy Your Own Boeing F-4 Phantom Ejection Seat | OhGizmo! What on earth are you going to do with a non-functional McDonnell F-4 Phantom II two-seat twinjet fighter ejection seat? Who cares?! It’s an honest-to-goodness ejection seat that was once in an actual airplane. It’s been ripped out and refurbished for your owning pleasure. This genuine Mk.7 rocket-assisted ejection seat from an F-4 Phantom II was made by British manufacturer Martin-Baker Aircraft Co. Ltd., the world leader in ejection seats for more than 60 years. The seat has been professionally cleaned and refurbished and riveted to a durable, hand-finished sturdy steel base with a natural-looking weathered finish. It includes a seatbelt, grip handle on right side of seat, empty oxygen tank and release button on left side of seat, Boeing Custom Hangar plaque permanently attached to the seat back, and Certificate of Authenticity. Each piece is unique and may vary slightly from photograph. Owning a piece of aviation history is rarely a cheap endeavour, and this seat is no exception. You’ll have to pay $15,000 for it, with shipping charges apparently not being included in that pricetag.